Capture your love this Valentine's Day with a gorgeous bouquet that is perfect for saying, "I adore every second with you," or "my life is better with you". An array of pink hydrangea, pale pink roses, red ranunculus, and pink spray roses are set in a gray ceramic pedestal vase. 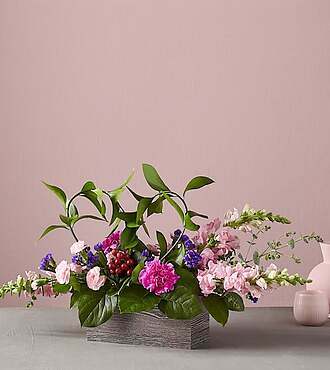 With Italian ruscus and pale pink alstroemeria, our Swooning Bouquet is a gift that adds a touch of love to wherever it' s place. STANDARD bouquet is approx. 15H x 16W. DELUXE bouquet is approx. 17H x 17W. PREMIUM bouquet is approx. 18H x 19W.